It is estimated that on average $27.4 million (Fijian) a year is what it costs to conduct 24-hour, seven-day week, and surveillance on one terrorism suspect. That will of course multiply if there is more than one suspect. 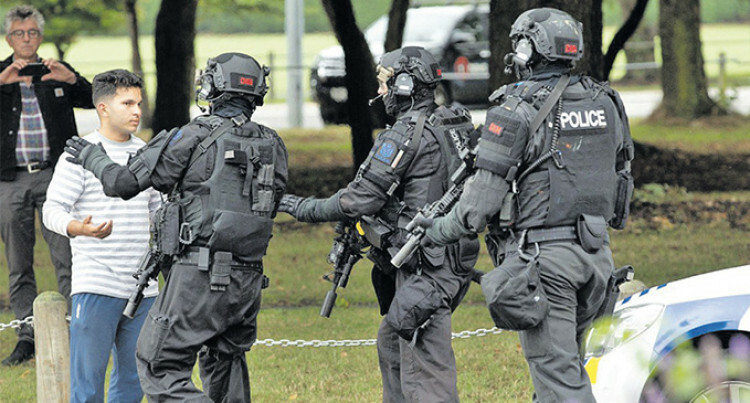 Officers from the Armed Offenders Squad push back members of the public following the shooting at Masjid al Noor mosque in central Christchurch, New Zealand, on March 15, 2019. ANALYSIS: Terrorism is so complex in nature that it is difficult at times to detect it before it happens. This is what happened in the Christchurch terror attacks in New Zealand that killed 50 Muslim worshippers. In the West, developed countries know that while they do their best it will be impossible to completely wipe it out. Their biggest challenge, which is not often openly discussed, is the cost. It is estimated that on average $27.4 million (Fijian) a year is what it costs to conduct 24-hour, seven-day week, and surveillance on one terrorism suspect. That will of course multiply if there is more than one suspect. Very few countries or none at all can afford to spend that kind of money for just one person. This is the reality that not only developed countries face but also developing countries like Fiji. Security experts say the causes of terrorism include psychological and sociological factors. They say terrorist networks recruit through social networks and social media they also say that one can monitor individuals who actively expand their networks and post violent ideological messages on social media. Then one could come closer to identifying individuals who might potentially be involved in recruiting for, or joining terrorist groups. Additionally, social groups use symbols to identify themselves and their cause as part of disseminating propaganda, radicalising and recruiting individuals around a cause. Moreover, one can potentially learn about potential causes of social conflict, and drivers of violent extremism through collecting information about the types of internet activities individuals engage in. Social media as a form of medium to gather information is becoming an important source for surveillance officers. On the other hand a crackdown on hate mail by local law enforcement officers could drive perpetrators underground. There is a strong school of thought that we should clear social media of hate mail which could sow the seeds of terrorism and spread the terrorists’ message. Surveillance, which includes, monitoring of phone calls, digital communications, movements and activities of suspects and sharing of information with intelligence agencies, is a huge and costly exercise.